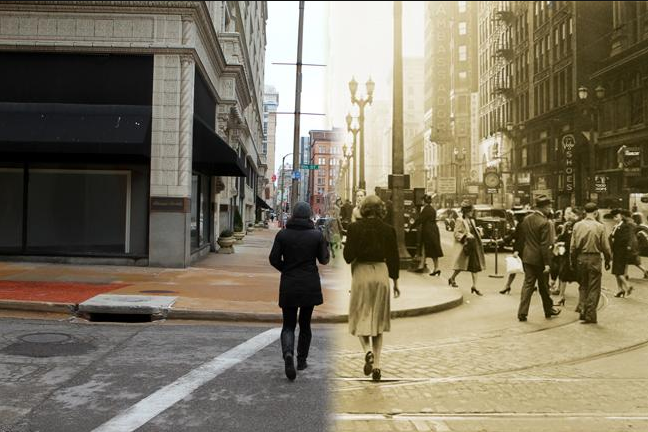 Who doesn't love "then and now" photos of St. Louis? They've been done over and over again and published by so many outlets, it's hard to keep track. The RENTCafe Blog has 10 great side:side photos like the one above. 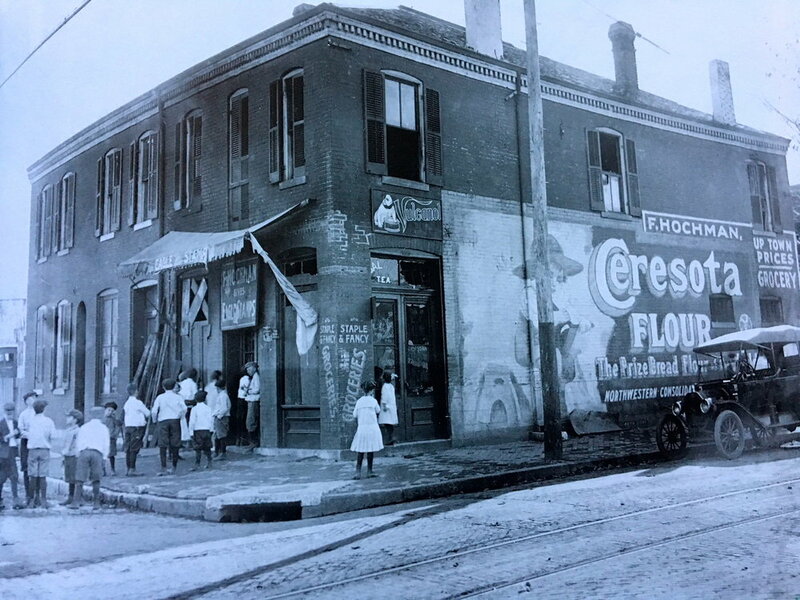 Heck, back in 2014 the Missouri History Museum offered a free app called "Historic St. Louis", containing ~300 historic photographs of street scenes and buildings in St. Louis. The app paired a GPS map with the photographs' locations (source). It's no longer available, but the point is, this is not a new concept. I've run into people on several occasions on my scooter rides, trying to get the perfect angle to do the "then and now", usually it's been older folks with a photo of their childhood home, trying to line it up just right. This is a hobby of many, myself included. It's harder than it looks and takes quite a bit of patience and skill...and, of course the right lens. Sometimes the challenge is getting the perfect "then" photo. A suggestion I would make is "Capturing the City - Photographs from the Streets of St. Louis, 1900-1930" by Joseph Heathcott and Angela Dietz. It's available on Amazon or wherever you like to purchase books. This timeframe is a challenge, because so much has been lost due to the elements, Mid-Century Interstates, surface parking lot lust, urban clearance and many other factors. 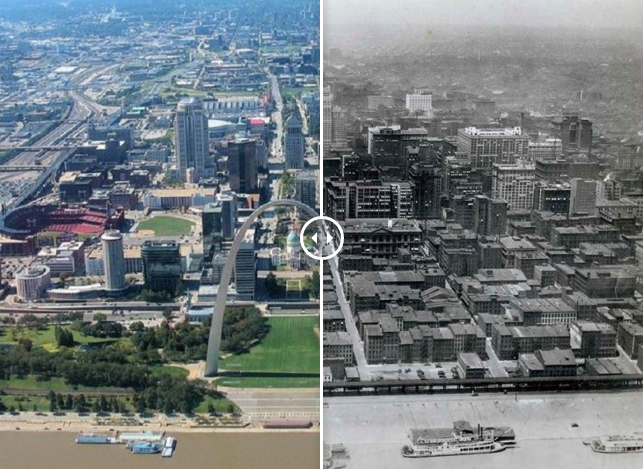 It would be great fun to have a sequel that covers St. Louis 1930 - 1960 and than maybe 1960 - 1990. Anyhow, this book is incredibly well done and the backstory on how the photos were preserved over the years is fascinating and heartwarming. Back in the early 20th Century, Charles Clement Holt (1866-1925), employed by the city's Board of Public Works, led an effort to photograph the streets of St. Louis for the Street Dept. Thousands of photos were taken each year. Most were lost, but a hobby historian/photographer/researcher (William Swekosky) salvaged much of the collection. This book is the first to catalog and display these photos. Swekosky (1894-1963), lived in the Benton Park Neighborhood. He was a dentist who spent most of his free time photographing the city and buildings, researching the various places. His personal collection really blew up on the 1930s and 40s. This is also when Swekosky obtained the first box of 4 x 5 inch glass plate negatives as City Hall was trying to de-commission them due to space constraints. He is single handedly responsible for saving the glass plate negatives from the landfill. Mr. Swekosky, I know I would have run into you on my scooter if our timelines crossed. When he died, his sister saved his works and donated them to the Sisters of Notre Dame in Lemay, MO. Over the course of many years, the Sisters lovingly archived and matched the collection to the writings. They cataloged and published their findings in a weekly feature in the St. Louis Globe-Democrat, which was a popular piece at the time. The Sisters continued to work on the photos into the 1990s when they finally decided they needed help. They enlisted the expert services of the Missouri Historical Society who knew what they had to do; and by 2001, the collection was transferred successfully and is now available to the public. If you are into old theaters, many of them are on full display. 7th Street looking north across Franklin Avenue, ca. 1900. The Globe Theater at 719 Franklin Ave and St. Patrick's School and Hall are in the background - photo source: "Capturing the City"
The painted signs on the side of nearly every building are in full view, they are like tattoos all over the buildings. They give you a glimpse into the marketing, advertising and products sold at the time. As a music lover, it is great to see the Victrola signs to conceptualize where a St. Louisan in 1910 would have purchased their records. You can go try and find the building and match the ghost sign to that when the paint was drying. This is a very fun endeavor and made much easier by the photo-editing software available to most. 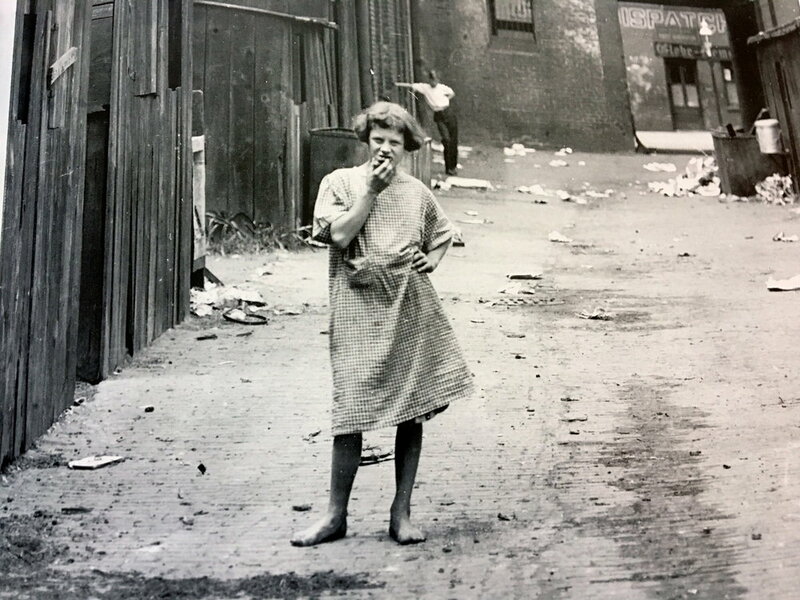 The street scenes of kids playing, people eating in soup kitchens, and taking baths in metal tubs pre indoor-plumbing document just how poor people were back then. The parks are represented as well, including kids playing in fountains (interracial is some cases), the looks on the faces of the people living in the tenements, the brand new streets in the burgeoning neighborhoods west of the core city, it's all here. You should see the Hill back in the day! And the area around the Grand Water Tower! The lives and landscapes are right there for you to dissect. The best thing is, the authors took the care to include addressees of the buildings, or at a minimum, the intersection and direction in the caption of each photo. 6th Street looking south from Lucas Ave, ca. 1906. This book is essential if you are into early 20th Century St. Louis. Or, if you are a fan of glass plate photography in general with the way it captures the looks on people's faces and the Victorian fashions of the time and a definition of poor that was much different from today's definition. Charles Clement Holt did the job he was set out to do: photograph the streets of St. Louis. He did that and luckily part of his work was preserved. Much of the collection was lost, but those that weren't trashed were saved not just once by Mr. Swekosky, but twice by his sister who had the foresight not to trash it and hand it off to group of saints, the Sisters of Notre Dame, who saved it once again. Then the Missouri Historical Society took responsibility of the collection and made it public and finally Heathcott and Dietz who published it. This is the kind of book in my collection that doesn't just sit on a shelf with the others. It has coffee stains on it, the cover is ripped up, pages dog-eared, pencil notes on the pages. It's been in under the seat on scooter rides. It's a constant source of inspiration for that perfect "then and now" photo. Thanks to all the hobby-documenters and photographers of St. Louis, you all inspire me to keep at it.